Milo Emerson Hayes was born on 18 June 1841. He was the son of Chester Hayes and Fidelia Holcombe.1 Milo Emerson Hayes died on 25 October 1911 at Southern Pines, Moore Co., NC, at age 70. He was buried at Granby, Hartford Co., CT. Apparently the Emerson Hayes enumerated in the 1910 McNeills, Moore Co., NC, federal census. He was 68, wife Otheila was 63. They had never had any children. Col. Jotham Bush married Mary Taylor. Mary Taylor married Col. Jotham Bush. [S239] Dororthy Dean Viets Schell, Viets Female, Page 57. [S239] Dororthy Dean Viets Schell, Viets Female, Page 58. Children of Orpha L. Holcombe and Nahum Holcombe Jr.
Lucinda Holcombe was the daughter of Nahum Holcombe Jr. and Orpha L. Holcombe. Dayton Holcombe was born on 25 August 1819. He was the son of Orator Holcombe and Cyrena Reed. 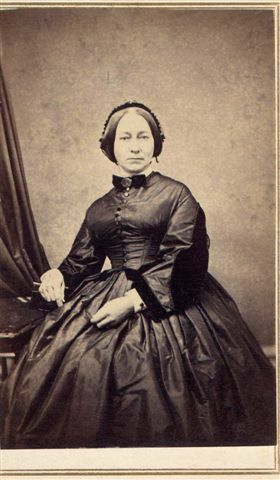 Harriet Holcombe was born in February 1821. She was the daughter of Orator Holcombe and Cyrena Reed. Luna C. Holcombe was born on 12 February 1823 at West Simsbury, Hartford Co., CT. She was the daughter of Orator Holcombe and Cyrena Reed. 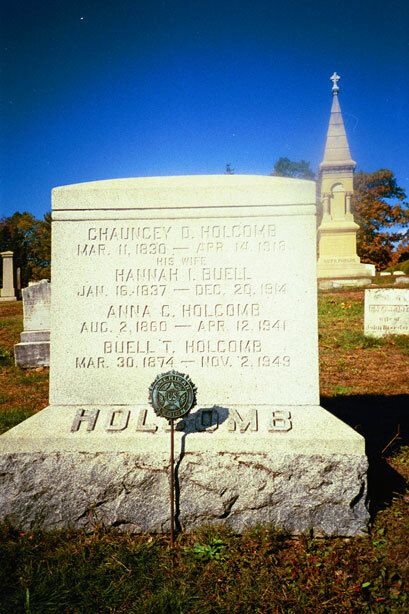 Munson Holcombe was born on 31 March 1824 at West Simsbury, Hartford Co., CT.3 He was the son of Orator Holcombe and Cyrena Reed. Munson Holcombe married Frances Amelia Holcombe, daughter of Nahum Holcombe Jr. and Sabra Holcombe, circa 1871. Munson Holcombe died on 9 March 1907 at age 82.3 He was buried at Center Cemetery, Granby, Hartford Co., CT.
Munson and Fanny were enumerated in the 1880 Granby, Hartford Co., CT, census with daughter Mattie. Boarder Henry Flagg and servant Marie Clark were also in the household. Munson and Fanny were enumerated in the 1900 census of Granby, page 7B, line 90, with daughter Mattie and her husband Charles. [S25] Hannah McPherson, Holcombe Genealogy, Page 192.2/Item A-8-1-10-13-2-5. Osborn Holcombe was born on 1 July 1828. He was the son of Orator Holcombe and Cyrena Reed. Chauncey and Hannah were enumerated in the 1880 Simsbury, Hartford Co., CT, federal census. He was a farmer, age 50; she was 43. Children in the household were Anna C. 19, Flora E. 15, Irene L. 10, Buel T. 6, and Dexter R. 3. Also enumerated was mother-in-law Irene Buel, 70, and laborer John Kelly, 59. Chauncey is recorded in the 1900 Simsbury census with Hannah, Annie, Buell, Dexter, and ward Caroline Ross. Chauncey and Hannah were enumerated in the 1910 Simsbury, Hartford Co., CT, federal census. He was a farmer age 80, she was 73. Children still in the household were Anna C. 49, Buell T. 34, and Dexter R. 33. Chauncey D. Holcomb, for many years one of the most prominent farmers in the western part of the town, died at his home this afternoon of old age. He was born in Granby, a son of Orator and Serena (Weed) Holcomb, and was the last member of a family of nine children. He was born March 11, 1830 and was probably the oldest person in town. He was married to Hannah A. Buell of Simsbury in 1859 and had lived in Simsbury since then. He leaves four children. Mrs. Frank Alford of New York city; Buell T. Holcomb, Dexter Holcomb and Miss Anna Holcomb, all of Simsbury. The funeral will be held in the family home at 2 o’clock Tuesday afternoon. The burial will be in the Simsbury Cemetery. [S65] Deanna Holcomb Bowman Thomas Holcomb, Vol. II:Pg. 129/Item 810a26. [S104] DAR DAR Lineage book, Vol 46:Pg. 270/Item 45632 as viewed at ancestry.com. [S284] Courant, 15 April 1918. Mrs. Hannah Buell Holcomb, wife of Godfrey D. Holcomb of West Simsbury, died at her home this afternoon, after a brief illness, of pleuro-pneumonia. She was born January 16, 1837, in the house where she died and where she lived all her life. She was the daughter of Irene Dexter and Peter O. Buell, her ancestors coming from Windsor with the first settlers and building a log cabin opposite the present Holcomb house, which is the old Buell homestead built in 1781. Mrs. Holcomb was a member of the First Church of Christ, Simsbury, for more than sixty years, and attended services there the week before her death. Besides her husband, she leaves four children, Mrs Frank Alford of Middletown and Anna, Buell, and Dexter Holcomb of Simsbury. Another daughter, Irene Holcomb Wilcox, died several years ago. She also leaves three grandchildren, Stuart Alford of Middletown, Helen and Howard Wilcox of Winsted. The funeral will be held Wednesday afternoon at 1 o'clock at the family home in West Simsbury. The burial will be in the Simsbury Center Cemetery. Burt R. Holcombe was born on 16 February 1838. He was the son of Orator Holcombe and Cyrena Reed. Nathaniel and Elizabeth were cousins. Nathaniel Griffin II married Elizabeth Griffin, daughter of Ephraim Griffin. Nathaniel Griffin II was born on 24 May 1706 at Simsbury, Hartford Co., CT. He was the son of Thomas Griffin and Elizabeth Welton. Elizabeth Griffin was the daughter of Ephraim Griffin. Elizabeth Griffin married Nathaniel Griffin II, son of Thomas Griffin and Elizabeth Welton. Dr. Custine, whose relationship has not been learned, except that he was uncle of Pliny's orphans, brought Pliny's widow and four minor orphans to Carlisle, Cumberland Co., Pa. Pliny Holcombe was born in 1764 at Granby, Hartford Co., CT. He was the son of David Holcombe II and Elizabeth Griffin. Pliny Holcombe died at Louisville, KY.
[S25] Hannah McPherson, Holcombe Genealogy, Page 120.2/Item A-8-1-2-2-6. [S65] Deanna Holcomb Bowman Thomas Holcomb, Vol. I.:Pg. 153/Item 81226. Moved with brother, Pliny Holcombe and family to Louisville, KY. Deborah Holcombe was born on 14 February 1767 at Granby, Hartford Co., CT. She was the daughter of David Holcombe II and Elizabeth Griffin. Deborah Holcombe married Ninian Griffin, son of Benoni Griffin and Mary DeLacy, in 1788. [S25] Hannah McPherson, Holcombe Genealogy, Page 121.1/Item A-8-1-2-2-7. The other two are Levi, son of Ezra and Phoebe Gillet Holcomb, and Levi, son of Joseph and Elizabeth Wilcox Holcomb. [S25] Hannah McPherson, Holcombe Genealogy, Page 121/Item A-8-1-2-2-9. Abijah Copers was the child of Purchase Copers and Theodocia Holcombe. Sylvester Copers was the son of Purchase Copers and Theodocia Holcombe. Azariah Halladay II was the son of Azariah Halladay and Lucretia Holcombe. Jedediah Halladay was the son of Azariah Halladay and Lucretia Holcombe. Theodore Halladay was the son of Azariah Halladay and Lucretia Holcombe. Selah Halladay was the child of Azariah Halladay and Lucretia Holcombe. Philo Halladay was the son of Azariah Halladay and Lucretia Holcombe. Sarah Holcombe was born on 23 December 1794 at Granby, Hartford Co., CT. She was the daughter of Joel Holcombe and Sarah Warner. Sarah Holcombe married Elisha Patch at Cattaragus or Onondaga Co., NY. Sarah Holcombe died on 5 May 1863 at age 68. She was buried at Paine Road Cemetery, Leroy, Lake Co., OH. [S25] Hannah McPherson, Holcombe Genealogy, Page 120.1/Item A-8-1-2-2-5-1. Seymour Holcombe died young. He was the son of Joel Holcombe and Sarah Warner. Nancy Holcombe was the daughter of Joel Holcombe and Sarah Warner. [S25] Hannah McPherson, Holcombe Genealogy, Page 120.1/Item A-8-1-2-2-5-3. Fannie was a lover of flowers, growing them continuously. Lived first near Grand River, Lake Co., OH, and later in Leroy, OH. She endured many crises of pioneer life there. Frances Holcombe was the daughter of Joel Holcombe and Sarah Warner. [S25] Hannah McPherson, Holcombe Genealogy, Page 120.1/Item A-8-1-2-2-5-4. Marcus Holcombe was born on 20 April 1802 at Granby, Hartford Co., CT. He was the son of Joel Holcombe and Sarah Warner. Marcus Holcombe married Louisa Brooks, daughter of David Brooks, on 27 February 1833 at Madison, Lake Co., OH. Marcus Holcombe died on 24 June 1880 at age 78. Marcus is recorded in the 1850 census of Leroy, Lake Co., OH, as farmer, owning real estate. Marcus and Louisa were enumerated in the 1880 Perry, Lake Co. OH, federal census. He was a retired farmer, age 78, she was 73. Children in the household were Delorna M. 34, daughter-in-law Emily J. 27, and granddaughter Frances B. 10 months. [S25] Hannah McPherson, Holcombe Genealogy, Page 120.1/Item A-8-1-2-2-5-5. [S104] DAR DAR Lineage book, Vol. XCVIII:Pg. 194/Item 97628. Elisha Patch was born on 30 July 1791 at NY. He married Sarah Holcombe, daughter of Joel Holcombe and Sarah Warner, at Cattaragus or Onondaga Co., NY. Elisha Patch died on 14 July 1869 at age 77, and was buried at Paine Road Cemetery, Leroy, Lake Co., OH. Louisa Brooks was born on 1 May 1807 at Bennington, VT. She was the daughter of David Brooks. Louisa Brooks married Marcus Holcombe, son of Joel Holcombe and Sarah Warner, on 27 February 1833 at Madison, Lake Co., OH. Louisa Brooks died on 29 October 1883 at Perry, Lake Co., OH, at age 76. Delorna and Jane were enumerated in the 1900 Madison, Lake Co., OH, federal census. He was 66, she was 57. There were no children in the household. [S25] Hannah McPherson, Holcombe Genealogy, Page 120.1/Item A-8-1-2-2-5-5-1. [S104] DAR DAR Lineage book, Vol. XCVIII:Pg 194/Item 97628. Lidora L. Holcombe was born on 25 November 1836 at Leroy, Lake Co., OH. She was the daughter of Marcus Holcombe and Louisa Brooks. Lidora L. Holcombe died on 17 March 1909 at Painesville, Lake Co., OH, at age 72. A farmer, musician, long a director of bands, attended High School, Painesville, OH, and served on Twp. school board of Perry, Lake Co., OH. When he was twenty he began working the home place on the shores and conducted the farm successfully. He now owns 100 acres, all improved land, and is engaged in general farming. Mr. Holcomb affiliates with the Democratic Party. He has served as a member of the School Board for a number of years. Dereath and Emily were enumerated in the 1880 Perry, Lake Co., OH, federal census, ED 88, in the household of his father, Marcus. Frances B. was 10 months old. D.R. and Lutn were enumerated in the 1900 Perry, Lake Co., OH, federal census. He was a farmer, age 44, she was 45. They had been married 3 years. The only child in the house was daughter Frank, 20. [S25] Hannah McPherson, Holcombe Genealogy, Page 120/Item A-8-1-2-2-5-5-3. Jane Hulburt was born in April 1843 at OH.1 She was the daughter of Henry Hulburt and Martha (?) Jane Hulburt married Delorna Marcus Holcombe, son of Marcus Holcombe and Louisa Brooks, in 1861 at Lake Co., OH.2 Jane Hulburt died in 1924. [S25] Hannah McPherson, Holcombe Genealogy, Page 120.2/Item A-8-1-2-2-5-5-1-1.